Cece Bell lives in an old church in Virginia and works in a new-ish barn right next door. She grew up in Salem, Virginia and drank a lot of limeades at the Brooks-Byrd Pharmacy downtown. She met her husband, writer Tom Angleberger, at the College of William and Mary, where they were both art majors. Cece went on to get a graduate degree in illustration and design at Kent State University. She has worked as a freelance illustrator for all kinds of nutty projects, but is now a full-time author and illustrator. 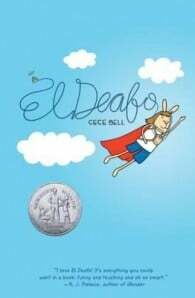 Her books include the Newbery Honor and Eisner-winning graphic novel El Deafo, the Geisel Honor-winning Rabbit & Robot, I Yam a Donkey, Bee-Wigged, Itty Bitty, and the Sock Monkey series. She has also created books with Tom, including Crankee Doodle and the Inspector Flytrap series.